TORY RICHARDS: Would you swim in this lake? Would you swim in this lake? 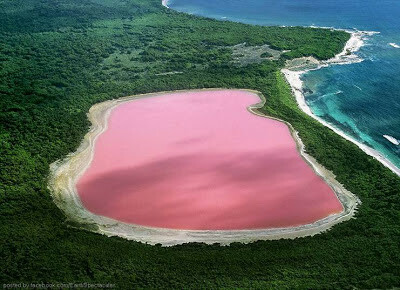 The pink and lovely..."Hiller Lake" (Western Australia) Its startling color remains a mystery, and while scientists have proven it's not due to the presence of algae, unlike the other salt lakes down Under, they still can't explain why it's pink. I would love to have this lake in my back yard i love to swim and for it to be pink would be something i would love to be in everyday!.. You're braver than I am. It's pretty but I have to wonder what kind of life is swimming around in it.